Bluetongue is an insect-borne viral disease of ruminants. Australia is free of bluetongue disease, but transmission of bluetongue viruses occurs in far northern Australia, coastal Queensland and the north coast and Hunter Valley regions of New South Wales. 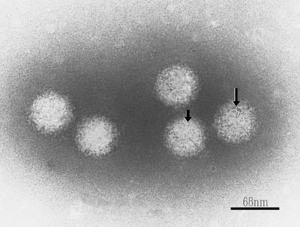 This transmission electron micrograph shows bluetongue virus prepared by negative contrast electron microscopy.